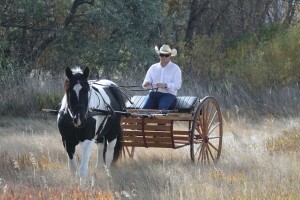 Nate grew up with horses and cattle on his family’s farm in Fort Collins, Colorado. His dad, Steve Bowers made a name for himself as a horse trainer (especially driving horses) and a trustworthy businessman. Steve taught Nate about being natural with horses and good with people. Nate was paid to start his first colt at the age of 8 and by the time he was 14 he was a partner with his dad, traveling the states teaching people and horses about driving, naturally. Nate now runs the family business from his home in Fort Collins, Colorado. Together with his wife Amy, Nate created Bowers Natural Driving, a revolutionary program that “uses natural horsemanship techniques to create a natural foundation for horses before teaching the skills of driving.” He currently teaches people about driving at Bowers Farm and also travels the globe teaching clinics. He recently partnered with Pat Parelli to produce the first of a series of DVDs on teaching a horse the foundation of driving. Find out about his DVD here.